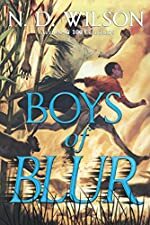 Boys of Blur by N. D. Wilson. Review: Imagine yourself running through the woods, badly bruised and cut being chased by a deadly stank. The sugar cane is burning; you're running as fast as the speed of light, not daring to look back. All of a sudden, you feel a painful sensation on the back of your head, and you are suddenly falling to the ground unconscious. Slowly feeling your life draining away, you're either quickÉor you're dead. This is just a small section of Boys of Blur by N.D Wilson. In Boys of Blur, courage is a trait you need to survive in the woods. That's exactly what Charlie and Cotton have. It all starts at a funeral for the death of Willie Wisdom, a former football coach. Charlie doesn't know it, but he has a step cousin, Cotton. Once Charlie meets him at the sugar cane farm, Cotton shows Charlie something that no one else knows. The church they were at was vandalized, but even more surprising, there was an unknown warrior trying to steal the body of Willie Wisdom! There is much more danger than the animals and the occasional burning of the sugar cane. Stanks are an unknown species of a ghost like creature, who can hunt you down. The horrible smell can knock you out or even worse, kill you! The three of them have to work together to survive, but there is much more ahead. What I liked most about the book is that the author always had a suspenseful ending to each chapter. I always wanted to read more. Each chapter interested me, whether it was action or arguments. When Charlie and Cotton ran, it was so suspenseful; it made me fall off the edge of my seat! The reader never suspects what is going to happen! This book could be recommended to boys and girls. This is a good book for middle school students and elementary kids. The setting makes the plot eerie and spooky. You don't know what's going to happen to the characters or what's going to pop out from behind a bush. Every second, the protagonists had to be aware of their surroundings, especially if they were vulnerable to the stanks. The fate of the world depends on Charlie and Cotton, and that makes the book very exciting. In my opinion, the characters show admirable traits. Charlie would do anything to save some one's life. The way he risks his life to get the antidote for Cotton was really brave. Sugar also shows courage because he helps Charlie get across the swamp. If you enjoy books full of action, suspense, and surprising events you should read Boys of Blur. Review written by Nicholas (6th grade student). We would like to thank Random House for providing a copy of Boys of Blur for this review. Have you read Boys of Blur? How would you rate it?